Craig and I have always felt that the best way to understand a city is to get out there on foot. We got a map from the tour desk and headed off to all the sites around District 1. 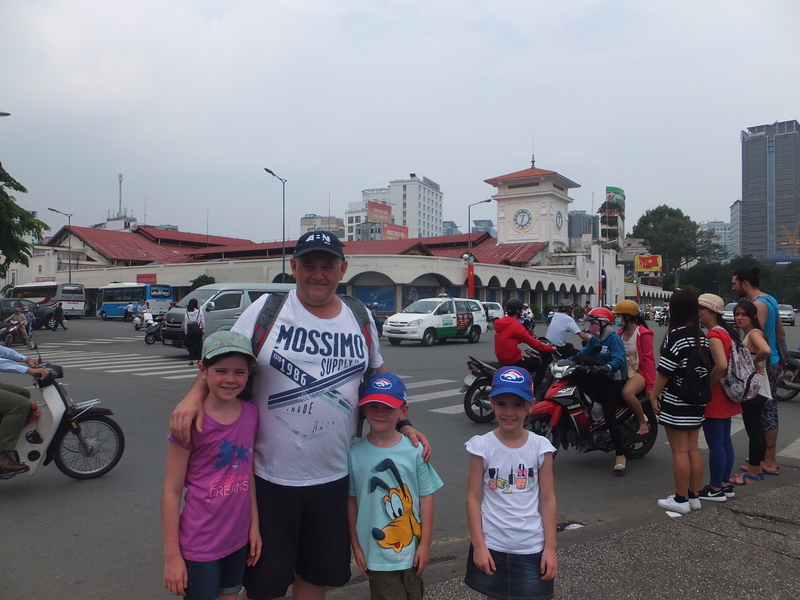 The hardest thing to get used to in Vietnam is crossing the road but as we had experience, it was much easier for us to grab the kids and give it a go! If you would prefer a tour, I highly recommend using Klook Saigon Discovery Tour, you’ll secure a competitive price and it will ensure you get the date that you are looking for. The secret to crossing the road in Vietnam is walk out at the one pace and for god’s sake don’t stop or run! The kids were freaked out to begin with but after one afternoon they had it down pat! They still had to hold hands though and we would walk in a straight long line. Our hotel, the Signature Saigon Hotel, was located in District 1 about block or two from the main market in HCMC, Ben Thanh Market. That’s where our city tour began! We headed off and wandered on in. Times have changed and unlike our last visit, the vendors were quite forceful with their selling tactics. My advice is to have a look around before buying anything so that you get a good idea of pricing. When I was given a price, I would offer a third of the price and then barter to half the original quoted price and nothing more. 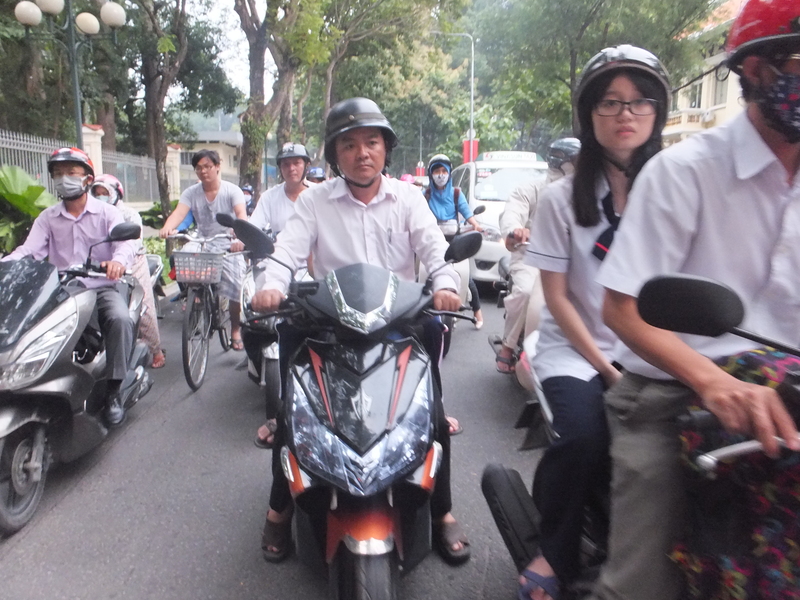 In front of the Ben Thanh Market, about to cross the crazy roundabout! Bartering is a sport, if you walk off and they are happy then the vendor has done well, if they seem annoyed it means you have done well! In the end, if you are happy with what you paid, you have done well. Craig got ripped off right royally this time but in the end it was cheaper than home anyway so thats the way it works! Inside the Ben Thanh Market. The weather was hot and muggy when we visited so we stopped regularly for cold drinks or ice cream! The kids thought that was wonderful and possibly what kept them walking. Next stop, the Rex Hotel. 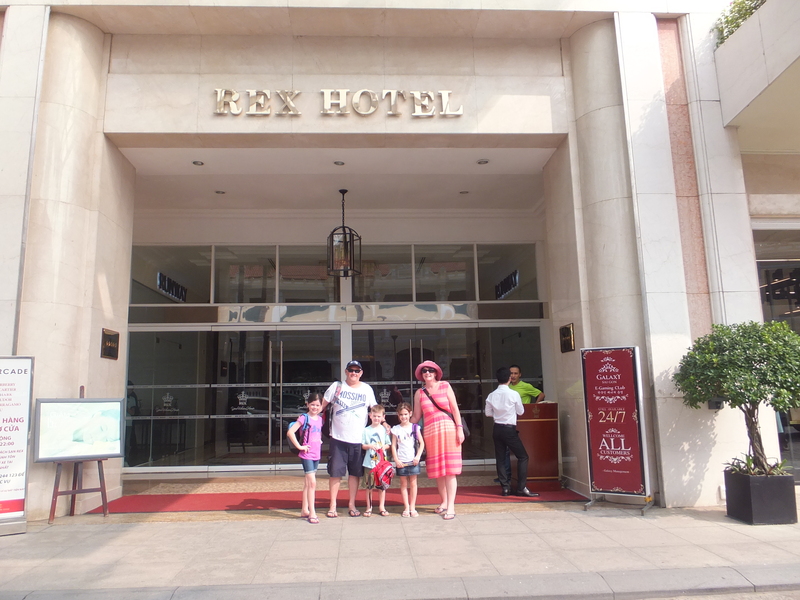 The Rex Hotel was made famous during the Vietnam War, as a popular hang out for American and Australian officers. The hotel was built in 1927 by the French and restored in 2003 to its current state as a 5* star, luxury hotel. We stopped here for lunch and a quick cocktail just like we did on the first night of our honeymoon. Keira took a photo of us in the same place as we did 12 years ago. The roads around this area have changed substantially and an underground train station is currently being built. This is the area where I noticed the biggest changes and it is wonderful to see things going forward. The roof top bar at the Rex Hotel. Cocktails at the Rex Hotel, just like 12 yrs ago on our honeymoon. 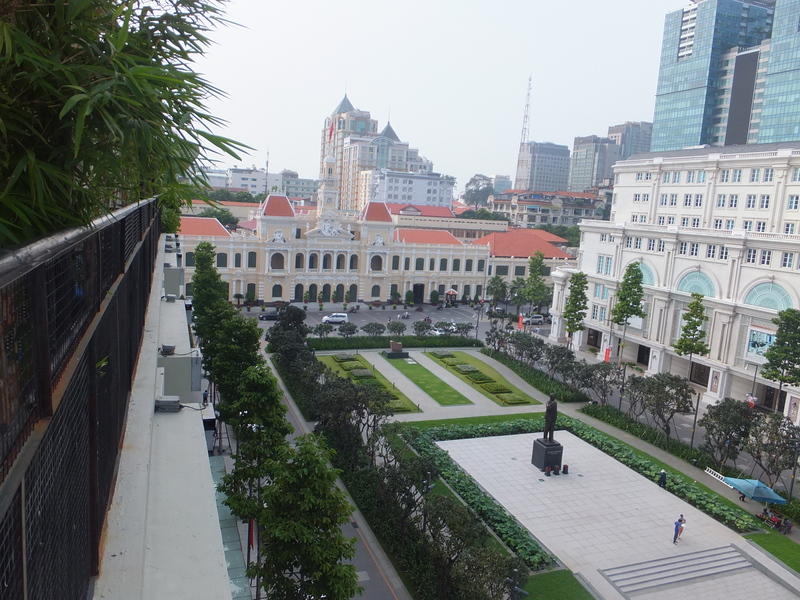 View from the roof top bar at the Rex Hotel, looking at the HCMC Town Hall. After lunch we headed off past the Ho Chi Minh City Town Hall. The roundabout has now been removed and the traffic mayhem has calmed down. It is easy to walk around this area and take in the sites and take photos of the Ho Chi Minh Statute with the the Town Hall behind. I love the photo below, Queen Alannah having her minions fan her in the heat in front of the iconic location. Queen Alannah, with her minions fanning her in the heat. 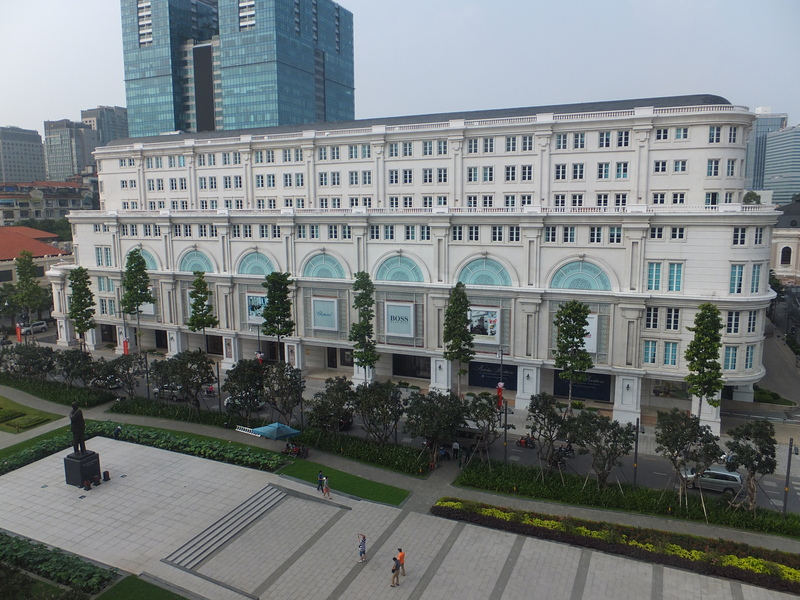 This area is also where the expensive shops are located in the Diamond Square Shopping Centre, the building is French Colonial and has been recently restored to match the rest of the area. The road that runs up to the Town Hall has been narrowed and the median strip widened with landscape gardens and pathways for tourists to walk around. 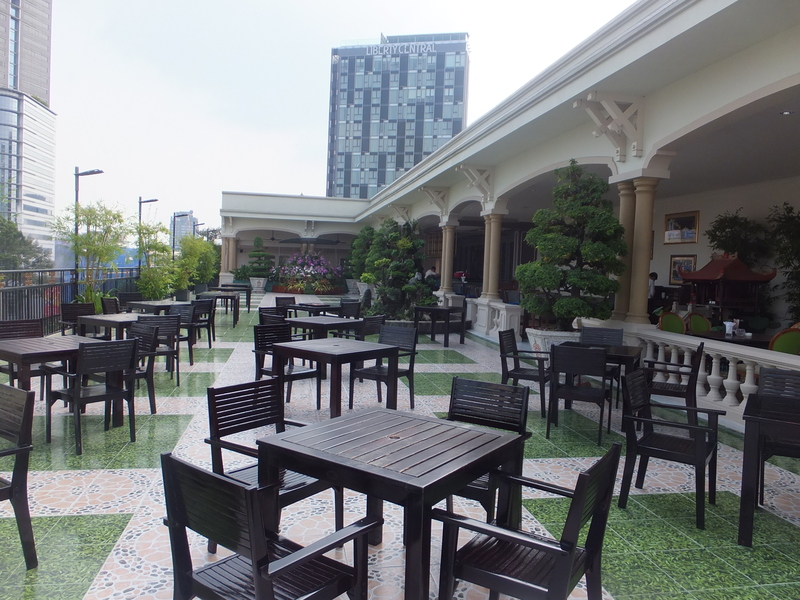 Its wide and spacious and very welcoming area to walk around even at night. 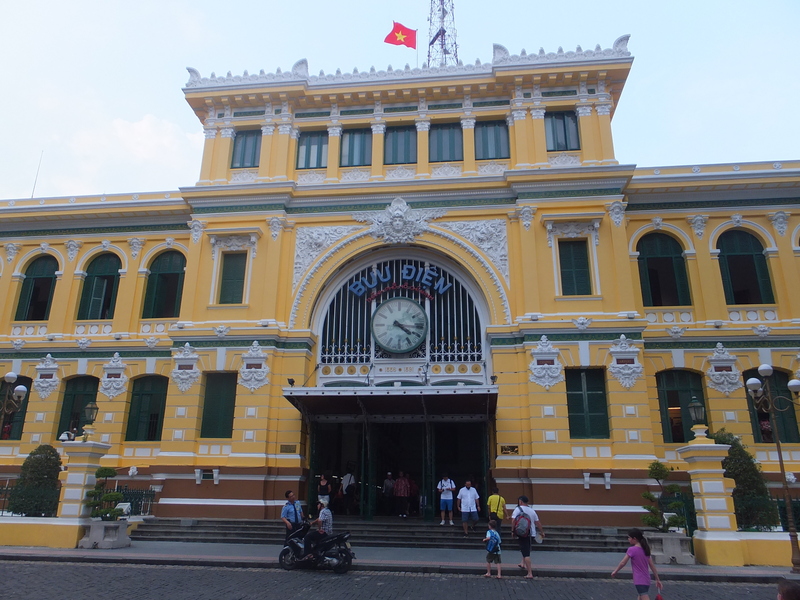 Next stop on the Lucas self guided tour of District 1 is Notre Dame Cathedral and the Saigon Post Office that are located right across from each other. Just a heads up, the Cathedral closes at 4pm, so if you want to have a look inside be there before then, we weren’t! The gates were closed but the doors were open so the kids got a quick look through the gates. 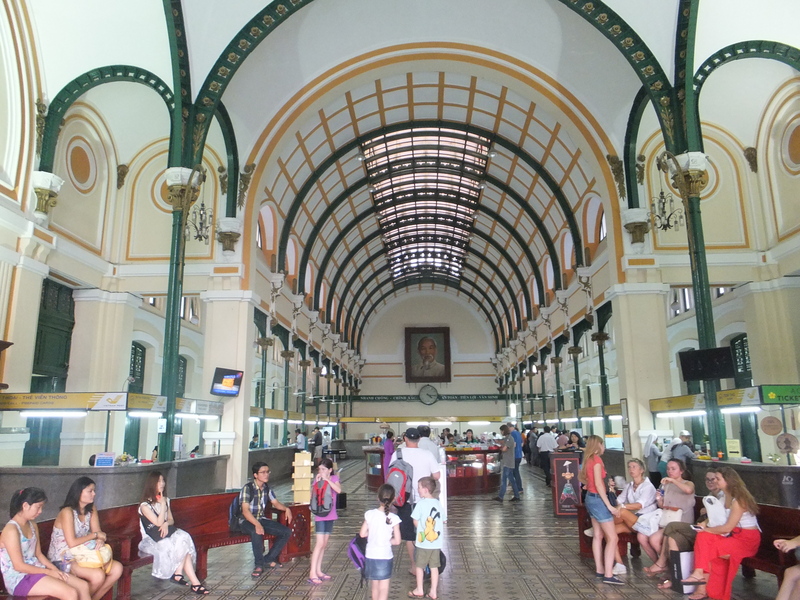 The Saigon Post Office is another French Colonial building and it still operates as a post office. There is a souvenir shop in the middle most filled with lacquered items, public phones around the walls and there’s a tour desk to organise any activities you would like to attend. Not to mention the post office! When we were leaving there was a man outside selling donuts from a tray he was balancing on his head. The kids were excited with his balancing act and wanted to try one. We bought a few and then the kids had photos with him and he put the tray on their heads, they thought that was wonderful. The Vietnamese always make an effort with the kids and you can tell that they love children. The delicious nutty donuts, we loved them the kids not so much! I found it very interesting that people would stop me and count the kids and say ‘are they all yours?’ I was quite surprised by this as Vietnamese families in Australia can have very large families. I started to look around and I noticed that more than 2 kids was pretty rare. So I asked someone about this and they advised that Vietnamese are restricted to a 2 child policy if they work for the government. If they have more than 2 they will be fired. Out in the country though, its fair game as long as you can feed them. You learn something new everyday! 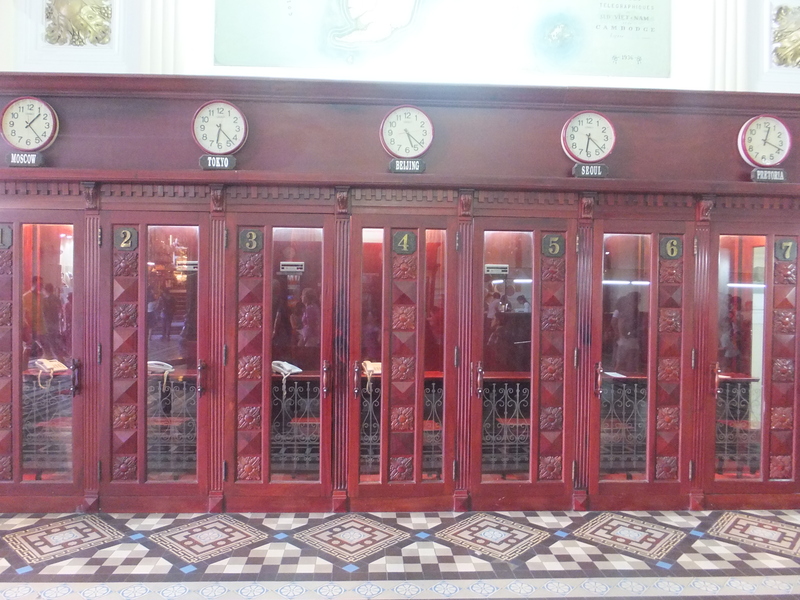 The public phone boxes in the Saigon Post Office. Next stop, well ice cream of course! 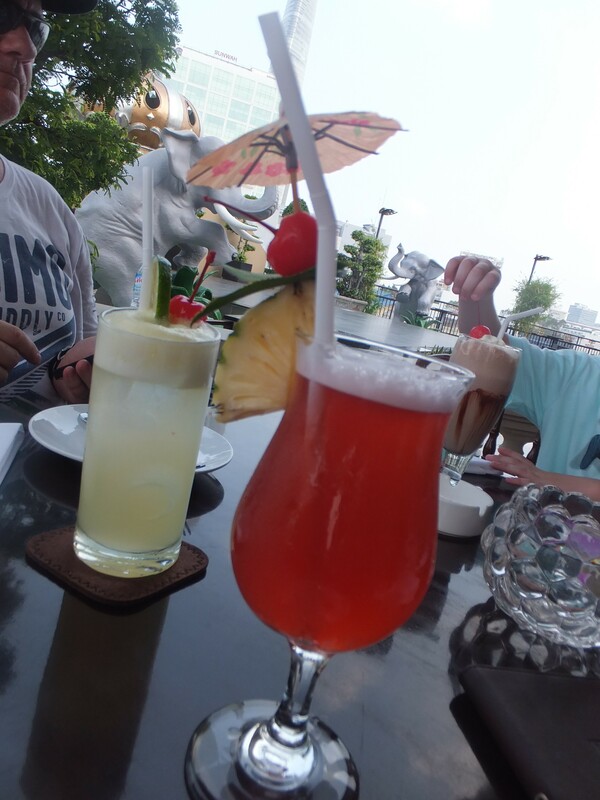 We stopped at a restaurant on the way to the Independence Palace for the kids to have an ice cream, Craig and I had a beer! There’s a lot of different beers to choose from in Vietnam but my favourite is called 333. We do steer away from the Bia Hoi though which is the homebrew you find sold on the side of the road! That stuff can be lethal! Ice cream stop! This is what kept them going! Back on the path, it was peak hour now and we learnt something new. The footpath becomes a road for motorbikes during peak hour! So a word of advise, stay close to the right and leave room for them to zoom by! They don’t go fast but walking with the kids they tend to jump around a bit so need to be careful not to jump out in front of the motor bikes. Getting in amongst it all! Crossing the road is an experience in itself! Right, so off to the Independence Palace which was originally the Presidential Palace, we knew it as the Reunification Palace last time we were here. I’m not sure when the name changed but either way they can call it what they like. While we were walking down, we were telling the kids the story of the end of the war with the tanks rolling down this very street we were walking on, right up to the gates and bust straight through them. The choppers out the back were still taking off with the last of the American soldiers when the gate came down and the actual tanks are still there! Craig loves history and was very animated whilst telling the story. Kids loved it though! 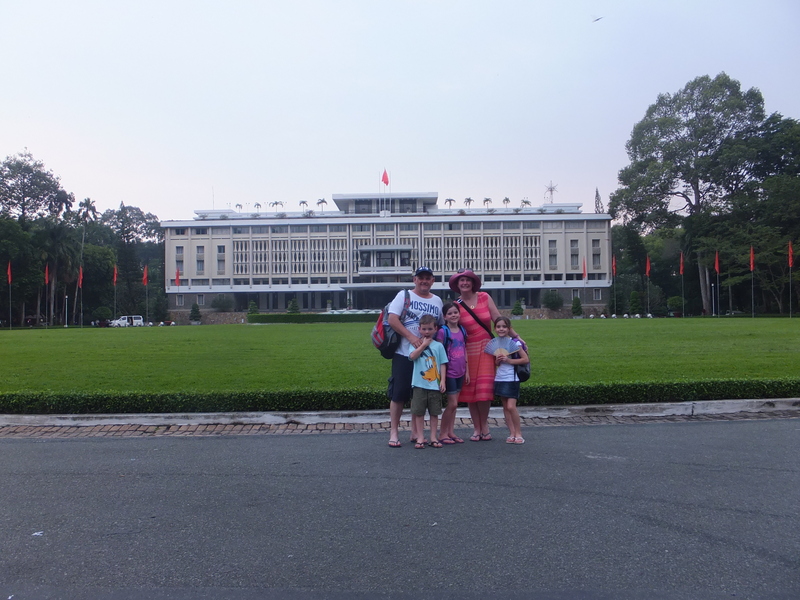 Family photo out the front of the Independence Palace. So its getting late now and the security guard is seeing the last of the tourists out before locking up. I asked him if we could quickly run in for a photo out the front and bless his cotton socks, if he didn’t come in and take a family photo for us out the front of the Palace. We pointed out the tanks we were talking about and he let me run over and take a quick photo of them too! The actual tank used to knock the gate down. So that was our walking tour of District 1, approximately 7kms the kids walked all up. We walked back to the hotel, our hotel had a convenience store next door so the kids got a slushy and had an early night. There were no issues with anyone going to sleep that night. I was working on the blog of course, washing down a couple of quiet beers by myself and Craig went out for a massage (I had one the night before in Nha Trang). We had a really lovely day, just wandering around and exploring. That’s what travelling is all about, getting out amongst the locals! I can’t tell you how many people the kids stopped and had photos with! Or how many people kissed or sniffed them! Love the people of Vietnam, always happy for you to take a photo. 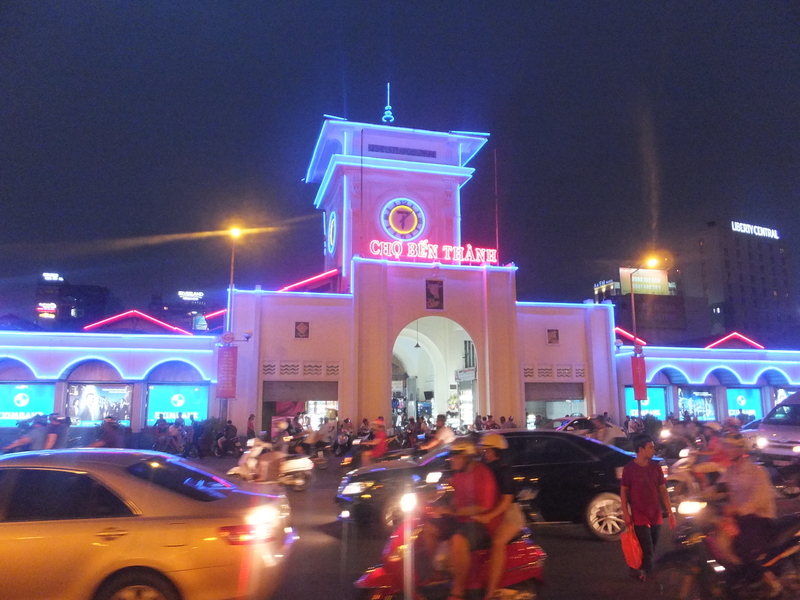 The Ben Thanh Market at night, on the way back to our hotel. So what did I learn, the kids will walk anywhere if there is an ice cream at the end of it! 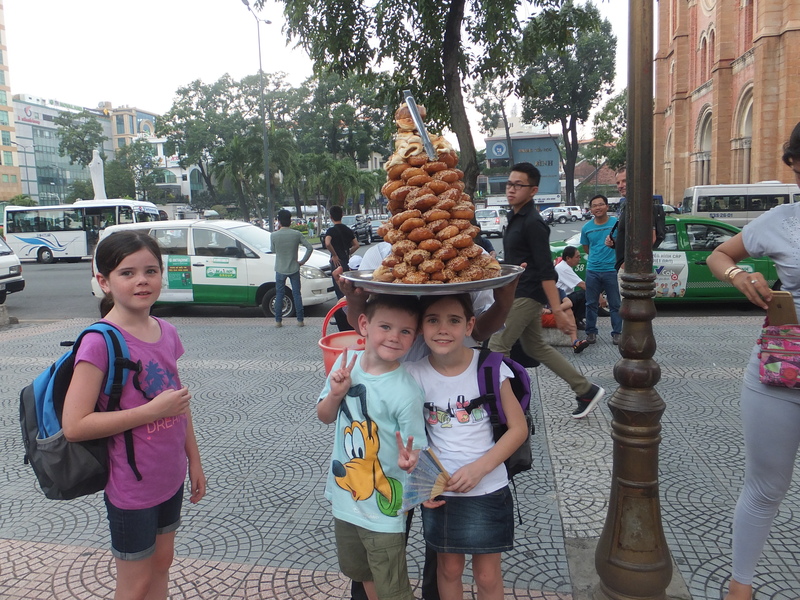 If you are travelling with toddlers, check out this post by Our Globetrotters, they have some great tips on travelling through Vietnam with kids much younger than mine. 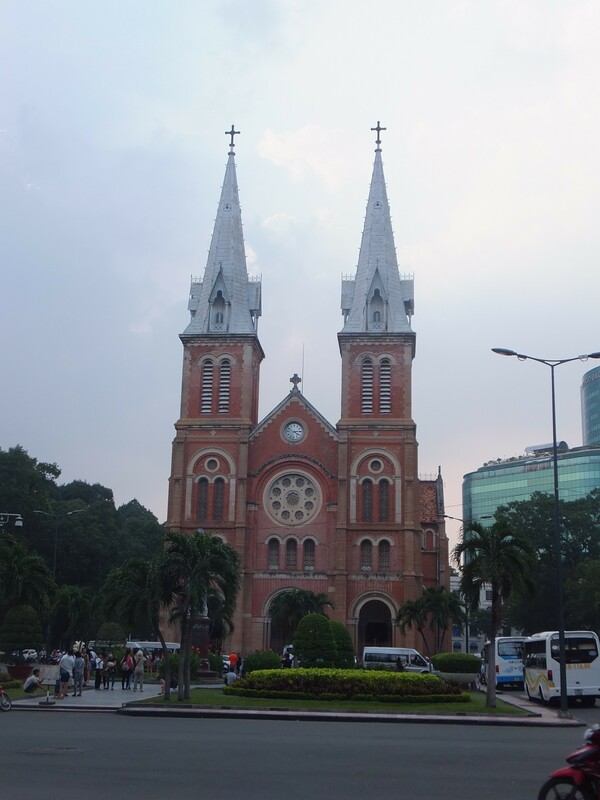 Also you might be interested in reading what else we did while we were in HCMC, we visited the Cu Chi Tunnels, the Mekong Delta, had a Cyclo Tour of HCMC and went to the Vietnamese Water Puppets. There’s plenty to do in Ho Chi Minh City and plenty to keep the kids entertained. Unfortunately we didn’t have longer as I would have loved to do more, here a great Vietnam itinerary, I could easily stay there for a month or longer even. Maybe next time! Looks like an interesting tour of a beautiful city that I hope to visit some day. I am sure my teens would have stopped touring at the shopping mall. Hi Rhonda, thanks for your comment. 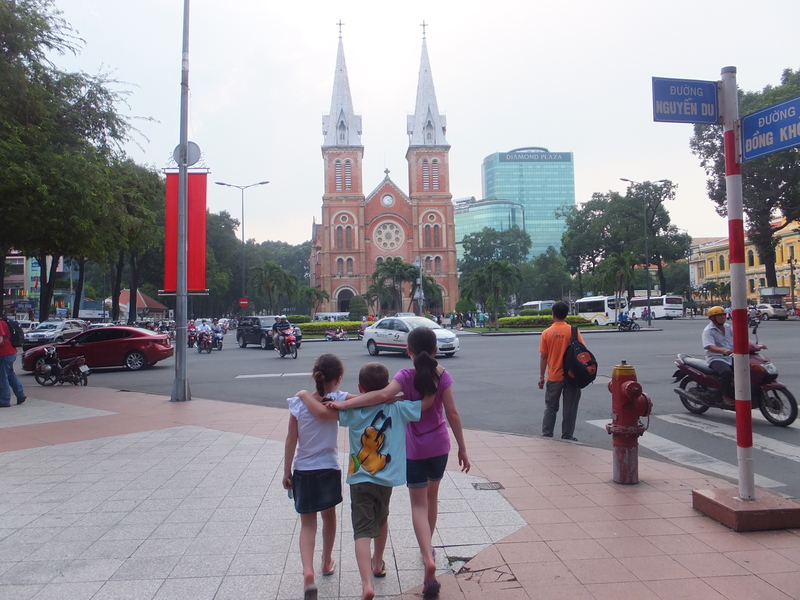 HCMC is beautiful city and we had a really great time. The kids enjoyed get out and amongst it but most of all I think they enjoyed all the ice cream stops as it was 35 degrees and 100% humidity!! Whatever keeps them going if you ask me! There’s loads of shopping in Vietnam, from bustling markets to the top boutiques it really has it all. Hope you get there one day soon, some many things have changed and moved on from when we were there last. I’m hoping its not another 12 years before we get back there. Looks like you all had fun. 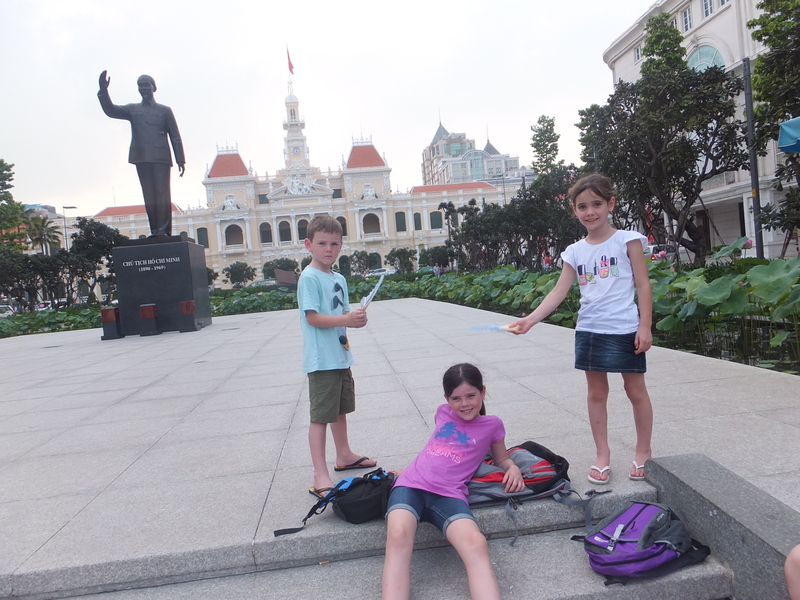 Ho Chi Minh is a great city for kids to explore. So many cultural differences, lots of action, plenty to keep them interested. Yes I have to admit, at the beginning I was a bit concerned that they wouldn’t be interested in HCMC but to their credit, they loved the history and really took to the city and loved everything about it. 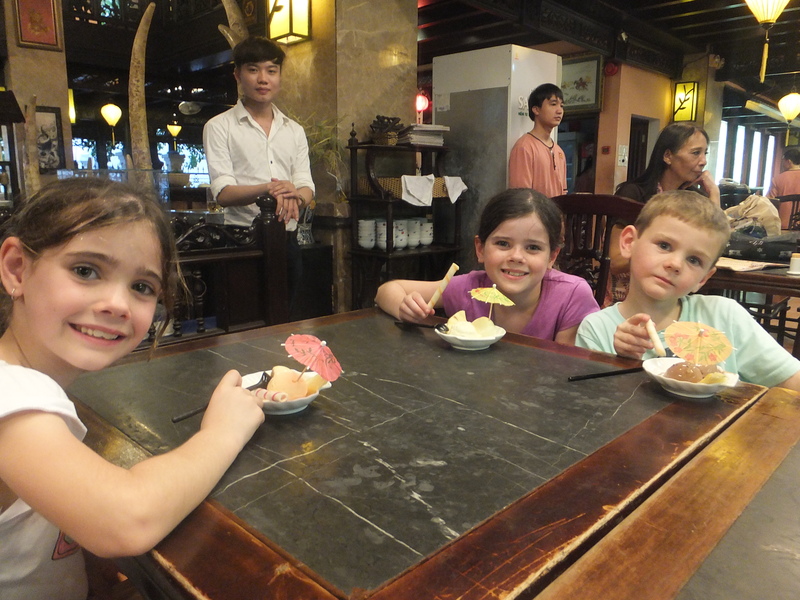 They particularly liked Cu Chi Tunnels, Mekong Delta and the Vietnamese Puppet Show. If you do go, take a cyclo city tour as it won’t be long and they want be around any more. We are off to Cambodia next week so will be interesting to see how the kids cope with that. Good morning, thank you for your comment, I’m not sure what happened with your first message I apologise for that. I’m glad to hear that you are enjoying our blog. I don’t have any huge words of wisdom! I can tell you that’s it requires a lot of effort but if you love it, it’s all worth it. Good luck and stick with it. it, you will be a great author.I will always bookmark your blog and will come back from now on. I want to encourage you to ultimately continue your great writing, have a nice day! Thanks for commenting, I’m glad you enjoyed my post, Vietnam is one of my favourite countries to travel around and I can’t wait to get back there again some time soon, maybe next year.